Why Choose Heavy Duty Room Dividers? 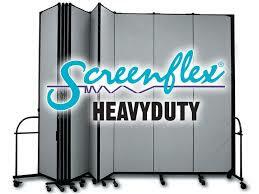 Screenflex Heavy Duty Room Dividers appear similar to their Standard Screenflex Room Divider product line. However, for industrial environments, their heavy duty divider is the best option. This commercial room divider can withstand the most challenging conditions found in most commercial facilities. That is why they recommend using heavy duty room dividers in high-traffic areas like airports, convention centers, hotels or sporting venues. What makes Screenflex Heavy Duty Dividers so superior? All these features combined produce the most sturdy industrial room dividers you can buy. More importantly, because this class of commercial accordion room dividers can handle unusually challenging conditions, Screenflex proudly designate it as the toughest room divider. dividers, Partitions, Sliding/folding temporary walls Solid temporary construction walls and partitions, Indoor construction hoarding walls, Temporary office walls with doors and windows, Temporary modular walls, Privacy screens, and Accent walls at factory direct prices. We sell no construction or renovation required movable walls, portable room dividers, partitions, sliding/folding temporary walls, privacy screens, and accent walls! We OFFERS THE SAFEST PORTABLE PARTITIONS, WITH THE HIGHEST QUALITY, LOWEST PRICE, AND FASTEST DELIVERY. WE OFFER A SOLUTION FOR JUST ABOUT ANY SPACE-DIVISION PROBLEM. SwiftWall: a revolutionary solution that replaces drywall constructed partition walls, the best alternative to drywall. The SwiftWall system is perfectly suited for creating temporary rooms quickly and easily, building solid temporary construction walls, building temporary offices, rooms, or storage utilizing SwiftWall's patented modular wall system. Please provide the height and length of the dividers/partitions/walls required. If you need advice as to which product(s) is best for your application, describe what you are trying to accomplish, include any pics and/or diagrams, and ​a Design Consultant will provide you with some options. SwiftWall Solutions:quickly and easily, build temporary offices, rooms, indoor construction hoarding walls,or storage, utilizing SwiftWall's patented modular wall system.